A man in Southeast China who had a strange fetish for sniffing his own socks after work whiffed his way to a serious fungal infection in his lungs, media reported Friday. The 39-year-old surnamed Peng initially went to a hospital in Zhangzhou, Fujian Province with a cough and chest pains on November 23. 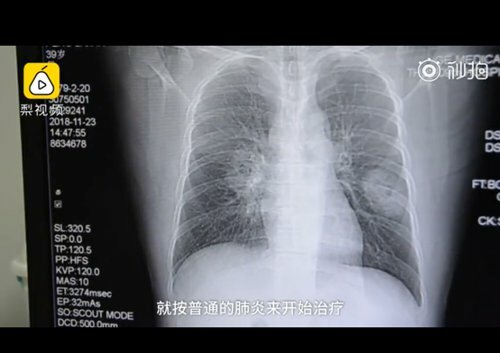 Doctors initially diagnosed Peng with pneumonia. But after his condition worsened despite a week of treatment, further tests revealed it was a fungal infection. That's when Peng informed docs of his dirty little habit - he enjoyed the bouquet of his own foot fragrance. "Every day after work, he would smell his stinky socks before washing," explained Mai Zhuanying, a doctor with Zhangzhou No. 909 Hospital's respiratory unit. Mai said that his sock sniffing, combined with a weakened immunity system from lack of sleep because of his newborn, enabled fungal spores to develop into a full-blown pulmonary infection. Social media users soon caught whiff of the news."Damn! I let my cat sniff my socks every day when I get home!" wrote "FuermoA." Fungal pneumonia can be fatal if not treated in time, especially for those with weakened immunity systems, medical experts said.